Last week we trialled a new approach to entering school instead of lining up and this seems to be working well so far. Our reasons for doing this are two- fold. Firstly, we have to be prepared for invacuation in case we had any sort of emergency situation whilst the children are outside. Our policy states that is an emergency situation arose we would blow the whistle three times to bring the children into school. Obviously, lining up would slow this process and may cause confusion. We have also been reviewing our Behaviour Policy in school and we feel this will support the updated policy by the children entering school gradually and without the lining up process. On the first whistle the children need to stand quietly on the spot, on the second whistle the first group walk in whilst the second group stand still and without talking and on the third whistle that second half of children walk straight in quietly. Parents can support us by encouraging their children to stand still once the whistle goes first thing in the morning. There will be a parent voice session after Easter for parents to give views on the new Behaviour Policy proposals. I felt so proud when we visited Portcullis House in London last month with our representatives from school. They worked hard on a RAP to present to the other regional finalists. Out of 1,200 schools we were in the final 10 schools in the room – an amazing achievement. Our local MP, Stuart Andrews took time out from the Brexit fury to come and see our presentation. Well done for the efforts of all the children which brought us to this stage and thank you to the four pupils who represented us so well, plus Mrs Thornton and Miss McGeogh who organised the trip. The children have been continuing their good work by scooting, cycling and walking to school over the last week. I and Kath Jennings, (our Trust Governor), also met with Stuart Andrews last week with other Head teachers and governors from the area to raise our concern regarding the cuts in education. We will continue to raise this issue with relevant parties as it has such wide implications for our school. We had a great Bangers and Bingo night on Saturday. Thank you to Duncan Craig for upgrading the Bingo calling facilities, to the PTA for all their hard work and the families who supported the event. Miss Skillington will begin maternity leave this week and we wish her well and look forward to seeing the new arrival. We look forward to welcoming Mrs Redman who will cover for Miss Skillington over the coming months. We will hold the annual decorated Easter Egg and Easter Cake competitions after the holidays. If your child would like to take part please bring in either/or a decorated hens egg or an Easter Cake on Monday 15th April to the school hall. They will be judged and then the cakes will be sold for 50p per slice for school funds at break time. I hope everyone has a lovely break and that the weather stays bright for us all. ALP Trust Head Teachers and Governors meeting Stuart Andrews MP to express concerns over local provision and budgets. It was lovely to see so many parents and carers at our school Concerts and Carol Service. I’m sure you’ll all be feeling in the festive spirit now! Well done to all the children who did such fantastic readings and singing – everyone really enjoyed themselves. Our festivities continue tomorrow with parties, Christmas lunch and the film afternoon this week which is in place of Funzone. Play day will take place on Friday. This week we say good bye to Mr Hiley as he moves to his new Bradford school in charge of PE. Mr Hiley has done a tremendous job of developing the sport and healthy living aspects of school with Mr Atkinson and will be really missed by everyone. The governors and I would like to thank him for his hard work and wish him well in the next stage of his career. I hope everyone has a lovely Christmas and wish you a healthy, happy New Year. It was great to see so many parents and carers at our writing morning this term. We hope it gave everyone an insight into the processes we are using in school for writing. It was such a successful morning that we will aim to repeat similar events later in the year. It has also been great to see a number of new members at the recent PTA meeting with new ideas. Our PTA raise over £6000 most years which makes a significant difference to extra items we can provide for school. We are now working to fund a new sound system for the hall and future possible projects could include playground improvements or lighting for the hall. Please come along and join us if you can - the more the merrier and more members mean more helpers at the events. If you would like to be a helper at events but cannot attend meetings, please let us know via the office email and we can add you to the helpers list for events. Thank you to the parents who attended and contributed to the Harvest assembly. Tins and packets will be distributed to the local food bank at Whackhouse Lane. Any surplus will be taken to the Bradford Food Bank by Mr Wood, a PGCE student who is currently working in school. I hope everyone has an enjoyable half term break. Welcome back to the Autumn term! The children have had a super first week back in school and look smart in their new uniforms. I have enjoyed finding out about their summer adventures and getting to know our new Year 3 pupils. We have asked children to prepare their speeches if they would like to be nominated as a School Councillor (pupil voice) or Harmony Group (hosting visitors and promoting peace & equality) representative over the next week. Please make a date in your diary for the ‘Meet the Teacher’ evening where you can find out all the information you will need for the year ahead about your child’s new class. Our PTA Annual General Meeting will take place on Monday 24th September at 6.30pm, followed by the first meeting of the year. Please come along and get involved as all funds raised throughout the year contribute towards the purchasing of additional resources for school. We are at the end of the summer term and what a term it has been! Our SATs results were excellent - soon to be posted on the data/results section of the website. They are a true reflection of the efforts and success of pupils, parents and staff working together. Well done everyone. Our Year 6 residential was fabulous. All the children had a great time - trying new things and pushing their own boundaries, whether these be just sitting on the big swing or shouting out as it drops from the maximum height. I always love watching children who have maybe found the academics of Year 6 particularly challenging, blossom when out of doors or team building - and often leading the way with new confidence. I have been speaking to Steve Hiley about possibly setting up some team building and outdoor activities for children to help to build their confidence as they pass through school. All the Year 6 children were a pleasure to spend time with - well behaved, fun to be with and keen to have a go at the activities - including the karaoke! The leavers concert also showcased the tremendous talent in Year 6. I know they will soon settle into Year 7 and have a successful future. The new Run for Life at the beginning of the school fair was a great success as have been the summer running sessions each morning. It has been a great way to start the day for everyone and we will definitely do this again next year if we can. The school fair went well as always and raised over £1,000 for the bungalow finishing touches. We are so thankful to the PTA for achieving this amazing transition from unused building to superb school resource are. It has been a sunny, hot term and I hope that the good weather continues and everyone has a super summer ready to return refreshed in September. First of all well done to the year 6 children, teachers (and parents!) who have worked so hard towards the SATs. The children tried really hard each day and I know they all did their very best. Now they have the summer term to look forward to with trips to Lightwater Valley and Herd Farm on the horizon. This is always a great term in school and an opportunity to make the most of our lovely grounds for lessons and playtimes. Please can parents make sure that children have sunhats and suncream if we get any warm days ahead. Thank you all parents who supported the Bangers and Bingo evening. It was well attended and raised over £400 for the Bungalow fund...nearly there! We are now in a position to tell parents about the staffing arrangements for next year. I am pleased to say that Miss Skillington will return in the summer term from maternity leave. Mrs Pickin has decided to leave Westfield at the end of the summer term to spend more time with her young family. She has been a real asset to the school over the past two years and I would like to thank her for her hard work and commitment. I will be taking over the SENCO role and look forward to meeting with parents in the Autumn term. Miss Swallow will step up to an Acting Deputy Head Teacher role from September 2018. Miss Skillington and Mrs Clarkson will job share half a week each in Year 5. We have also engaged a new, part time member of staff for September, Mrs Taylor, who will job share. Miss Swallow will be teaching in the mornings and Mrs Taylor in the afternoons. Miss Dawson will also leave at the end of the summer. She has secured a job in Horsforth and we wish her well. We will really miss her (and the Harry Potter club!). I am pleased to tell you that Miss McGeoch will also join the staff team in September. She has completed her PGCE training with us with great success and we look forward to welcoming her back. If any parents have any questions regarding the new classes please call in to see the teacher or myself to have a chat. Our year 2 transition day is Tuesday 19th June and all children will get the chance to meet with their new teacher on this day too. Our school fair is fast approaching on the 16th June from 12 noon to 3pm. We would welcome parent helpers and new members of the PTA are desperately needed. Please come along to the meetings and get involved if you have a little bit of time to help to raise money for the school. It would be lovely to see you. A few staff changes that will take place as we move towards the end of the Spring Bank term with some staff moving on to pastures new. To begin with we say farewell to Mrs Stokey who is leaving Westfield to focus on her family commitments on the 9th May. She has carried out a variety of roles in school including Behaviour Manager, HLTA and Lunchtime Behaviour Support Worker really well. Mrs Wear will increase the amount of mentoring she does from September 2018 in order to support the behaviour work in school. We also say farewell to Miss Leeming on the 11th May, who has worked as a Lunchtime Supervisor over recent years. We wish her well. Mrs Nutter will be leaving on the 18th May after an amazing 25 years of service at the school. Mrs Nutter has also held a wide number of roles and responsibilities, from Lunchtime Supervisor to Learning Support Assistant. She has supported a large number of SEN children over the years with dedication and has seen many children pass through and succeed at Westfield. Mrs Nutter will leave Westfield on the 18th May and we wish her well for the future. I would like to take this opportunity to thank all three of these valued members of staff for their hard work and commitment whilst working at the school. They will all be missed and we hope they enjoy their new ventures in the future. The term has been a busy one with lots of exciting activities! Firstly, I would like to praise the children who attended the Easter service at St John’s for their fabulous singing (a number of parents who attended have stopped me to say how great it was), reading and instrument playing. The whole school are singing brilliantly at the moment, in assemblies and lessons. I was speaking to the children about it and telling them how research shows that a “singing school is a successful school” because of all the knock on effects (development of memory, coordination, rhythm etc) which help them with their learning across the curriculum. I don’t think it has been better at any time since I joined Westfield. Our school choir will perform at Yeadon Town Hall on 17th April in the local “Let’s Celebrate” event – ticket information is available from school if anyone would like to watch. The Sports teams are also going from strength to strength with a wide variety of great activities taking place. Our Year 4 team won the West Yorkshire Championships for orienteering on Tuesday, and the Year 6 team came fourth in Yorkshire. These are both tremendous achievements of which we are very proud. Mr Atkinson and Mr Hiley will be holding a running club before school after the Easter break. Any children who would like to take part can do so from the playground from 8.30am each morning. A separate letter will be coming out. Thanks to these teachers for their hard work with the sports and also to the staff who help them and will be helping to run the new club. The snow made life challenging this term – I would like to thank all the parents who supported school by reading the texts and varying their own arrangements when we had late starts - thank goodness for the texting service as senior staff couldn’t get to Yeadon either so the old fashioned phone messaging would not have been very successful! Hopefully we are finished with this now, though the Easter weekend forecast had the snow word in it again last night! After Easter we will be having a couple of art focus projects in school. One of these is to produce work towards the Trust Art Exhibition and will be based on recycling and the current theme of plastic in our environment, particularly the oceans. If your child would like to bring in any items that might end up in the ocean or countryside (eg milk bottles, lids, plastic McDonald toys) we will use these in the project. The other art theme will be an art day based on painting onto pebbles with dots, and art work to support the local RAFA Club in their 100 year anniversary. In preparation for this Mr Woolford, one of our parents who is a professional landscaper, has been helping to run a club on Wednesday evenings, targeting the quad area in the centre of school. He has led a team of children in clearing and cutting back the plants there and laid a pathway which will then have the pebbles from the art day on display. This is a really exciting project and the quad is looking great. Thanks to Mr Woolford (and his helpers, including Mrs Jones) – it looks like it has had a make- over already and I know the children have loved the club. This club will run again from the second week after Easter – a letter will be sent in the first week back. On the subject of Spring, most of our eggs hatched successfully, leaving the teachers and classes with a little brood that they will all be sad to see go back today. It is always really exciting and uplifting to watch the process of them hatching – we will be doing this again in the future. It is amazing how quickly they grow. The decorated cakes and eggs on Tuesday were wonderful – really imaginative and hard to select the winners. The cakes were chopped up and sold – I think this fuelled some of the enthusiastic singing in Church! Thank you to Morrisons who donated lots of lovely eggs and other Easter treats to use for our raffle, Easter activities and prizes. They are fantastic supporters of school events and have helped us with prizes and fundraising a lot over recent years – it is really appreciated. Speaking of fundraising, the PTA have rescheduled the Bangers and Bingo night to Saturday 12th May. This is rescheduled due to poor ticket sales – partly due to the snow. Please come along and support school. This has always been one of our most popular family fundraisers and we really want it to go well as it is an evening of fun that all the family can join in with. The PTA are always open to new ideas and new members so get in touch if you have anything you would like to suggest. Today we say farewell to Mr Turner who is leaving us after two years at Westfield. Mr Turner (or Mr T as he has come to be known by the children! ), came to school as a behaviour worker but has more recently worked across school in lots of classes and groups. I would like to thank him for his hard work and wish him well for the future. Finally, I and the staff would like to wish everyone a peaceful, safe and happy Easter. This week’s assembly and reflective focus is based on looking after and respecting wildlife. This links with the Great British RSPB Birdwatch Weekend (27th and 28th January), but I also speak to the children regularly about having hobbies and interests which help you relax. This is again an ongoing theme as part of our termly ethos “Life Changes” where we are talking about strategies to help us all cope with changes that happen throughout our lives. Watching the wildlife around us and getting in touch with nature is a proven way of relaxing and the children love to spot and identify creatures out of doors. Each teacher has hard copies of the RSPB sheets for any child who would like to take part in the birdwatch. If they complete them at home and return them to school for next Monday’s assembly I will post any forms in one envelope to the RSPB. This survey can also be done online and there are lots of information pages on the RSPB website from how to do the birdwatch to the processing of the results at headquarters. It also gives ideas for easy birdfeeders such as fruit kebabs to make for the birds and a live webcam at one of the RSPB sites. I will be enjoying an hour of peace at my lounge window (with the all essential cup of tea!) and will share my findings with the children next week. Happy New Year to everyone! I hope you had a lovely Christmas break. Welcome back to the Spring term which is already packed with lots of fantastic learning opportunities. In addition to new topics in each year group, on Wednesday 24th January we will have a curriculum enhancement day led by Kath Clarkson. Our previous theme days have been so popular with the children that we decided that throughout the year staff will each run an enhancement day based on their specialism or a current theme. We also have Year 4 skipping to look forward to and lots of topic based activities. We will also carry out the RSPB birdwatch with some children in school and encourage the children to take part at home around the weekend of the 27th and 28th January. It is easy to register on line if you would like to take part at home. I will be going to buy some new bird tables and feeders this weekend to place in the wildlife area. Last week we had a few chilly days with seasonal snow. Please can I remind parents that the children play out if possible every day and need warm coats, hats and gloves when it is really cold. Also, please refer to the School Closure Policy on the website if we have any more severe weather and look out for texts to let you know if school is opening late or closing for the day. On icy mornings, we grit a small number of walkways for pupils and parents to use and may even use the main gate if the paths are really icy. This is the safest way to keep everyone safe on such a large site and we thank you for your support when this happens. This terms mindmate assembly theme is ‘Life Changes’ which also links to PSHE with our return to school ethos focus on ‘New Year Resolutions’. I cannot believe it is the end of the Christmas term already! The recent events have been really lovely. I thought the standards of singing both in the concerts and in Church were outstanding and the children did really well to learn all their lines and speak so clearly. I would like to thank parents for their support and hard work this term. The School Fair buzzed with excitement and raised around £1,600 towards the Bungalow appeal. The work that is done at home supports all the children so well, helping them with basic skills – a big thank you to all parents who have put in any extra support at home and to those who help in school and on trips. Thanks also for contributions to parties and other appeals throughout the term, it is most appreciated. I know some of the children missed the PTA Disco in the Autumn term. Sometimes we trial new ideas such as the Film Night instead and the Fashion Night for the parents, but we would be happy to hear from anyone with suggestions or reintroduce a previous event if this is what the families would like. After Christmas I will be sending a parent survey which will ask questions about the Autumn Term and will include some questions about the PTA events. The volunteers work hard to raise money for school and provide enjoyable events for everyone. If anyone would like to join us, there will be a meeting in the New Year (dates to be announced in January) so please feel welcome to come along. Thinking ahead to the New Year, we are constantly striving to ensure that our children maximise on teaching and learning time in school. I also want to let you know that from January 2018 we will make small amendments to the weekly timetables of some classes and will no longer have a reward play on Friday afternoons. The reward playtime was introduced historically when the old behaviour system was in place. Pupils who did not receive a detention during the week gained an extra playtime as a reward for good behaviour. The leadership team have been reviewing teaching times and feel the Friday afternoon would be more focused and productive if we had a full teaching afternoon. Now that school has a Restorative Approach to behaviour, there is no longer a detention system in the same way. Children who receive yellow or red slips take part in a restorative playtime session during the week, making the reward aspect of Friday playtime now out of date. Funzone is also used to reward the children who always behave well. If any pupil has been given a number of red or yellow slips they are not allowed to take part in Funzone. Please see your child’s curriculum newsletter, which will be sent in the New Year and may outline any resulting changes for your child’s class such as PE days. A small number of parents have asked about the holiday dates for the coming year and 2018-2019. These are displayed on the school website. The Aireborough Trust may slightly alter dates and agreed training days in the way they feel gives the best balance to the academic year. Please double check before booking holidays etc. I would also like to inform parents that Mrs Leeming will be retiring on Wednesday. She has worked at Westfield since 1989 in a variety of roles including office work, cleaning, lollypop lady, lunchtime assistant and classroom assistant. She will be really missed and we wish her a long and happy retirement. Mrs Stokey will also be reducing her working time after Christmas. She will still work in the mornings and at lunchtime from Monday to Wednesday each week but will no longer teach in the afternoons in her HLTA role. This will be carried out by Ms Angela Phillips, a qualified teacher who has held a number of roles in school over the past 15 years. School is looking lovely and excitement is rising for the festive season. Thank you to all the parents, staff and children who made the fair such a super event last Friday. I really enjoyed the evening and school buzzed with people having fun. Thanks especially to the PTA who organise these events, working hard for weeks behind the scenes. The concerts have been lovely this week. The children looked fantastic in their costumes and spoke and sung really well. This event gives those who would like to take part in a production the chance to do so and this is especially good for some children who visibly gain confidence whilst taking part in these productions.Thanks to all staff and pupils for their hard work. I felt really proud today to take the Harmony Group to the Guiseley cenotaph for the laying of the wreaths today. The children asked some really pertinent questions and we were asked to place a cross for a veteran who has lived in the area for many years and has now retired to North Yorkshire. When fighting in WW2 he was stood with two other friends when a bomb exploded, killing the soldiers either side of him but leaving him standing. For many years he has placed a cross for these two friends in remembrance of their service and we were proud to help him do this on this occasion. The first half term has passed quickly, the evenings are closing in and it is feeling more autumnal! The children responded well to the Wear Yellow Day for Childhood Cancer. Over my time at Westfield we have had a few children affected by this disease and it is so important to support this cause as childhood cancers can be treated well and all new research may affect our current pupils and those of the future. Thanks to Mrs Pattison for her support with this event each year. We sadly had to cancel the Fashion Show / Ladies Night due to lack of ticket sales. Just when I had persuaded (twisted arms!) staff to strut their stuff! We sometimes try new ideas for the PTA and welcome any new suggestions, though sadly not all new ideas take off. Our next event is the Film Night for children where we will show the BFG. See the newsletter for the list of upcoming other events and please come along and join the PTA - all new members are welcome and we are currently busy organising the Christmas Fair. I really enjoyed taking three upper school children to the writing enrichment day at Ireland Wood School with poet, Terry Caffrey. We spent a whole day performing and writing poetry with fantastic results. Terry really got the children involved and fired their imaginations. Well done to those young writers and keep up the good work. The Enterprise Day caused great excitement and we have some future detectives in our midst. The children really enjoy these focus enrichment days , boosting team work and problem solving, and we aim to have more of them across the year. Thanks to Miss Johnson for organising this. The Harvest Festival was a lovely celebration with a record turn out of supportive parents. The singing was beautiful and all food donations went to the local Food Bank at Safe Haven, a charity which our own families have benefited from over recent years when faced with difficult times. Many thanks to all parents who donated and well done to the children for the readings and singing. In addition to our Year 3 children who have, as always, settled very quickly and already look like they have always been at the Junior School,we have two new additions to the school. They are our baby guinea pigs, named by the children as Ant and Dec. We decided to buy these little cuties because so many of the children reacted with such excitement and enthusiasm to the chicks earlier in the year. They really loved having animals to care for and many of the children who did not own a pet benefited from caring for and handling the pets. The children will be taking care of the guinea pigs (under the guidance of the class teachers), helping to feed them, clean them and giving them carpet playtime and handling time. It would be lovely for a child to take them home when it is their class week for Ant and Dec. There will have to be some basic rules - that there are no other animals such as dogs and cats that may frighten or upset the guinea pigs, that there is no-one with any allergies etc and, most importantly,at parents know their child has volunteered them as the hoteliers for the weekend and can transport them to and from school! I know from the initial reactions in school that the guinea-pigs will be really popular and well loved. The school is looking lovely after the change around in the summer and the new cladding on Grassington is looking very smart. We will try to empty the container as soon as the classroom has been signed off so we can use the room fully and it should make it more cosy for the winter months. We hope to see lots of parents at the Meet the Teacher night next week where you will get all the information you need to help your children over the coming year. I look forward to meeting people on the night. Once again we are at the end of a very busy, exciting year, and the children and staff are all ready for a well deserved break. The summer has seen a super rise in the maths SATs results, due to continued hard work in this area and the new maths session arrangements where the children have worked for the first part of the lesson, then staff have marked the books and regrouped the children whilst they attend assembly, tailoring the second part of the lesson according to the outcomes of the initial marking session. This has allowed the staff to either stretch the children or consolidate concepts they are unsure of immediately, with this same day intervention taught by the teacher before any additional interventions by the teaching assistants later in the day. Well done everyone for making the new system impact so well not only in Year 6 but also across school. Welcome to Miss Dawson who has been in school during the year completing her PGCE qualification. Now that she has passed with flying colours we have asked her to cover the maternity leave for Miss Skillington. Miss Skillington has had a lovely baby boy, Luke, and they are both doing well. Miss Dawson will stay with us throughout 2017-2018 in Year 4 which will provide excellent continuity after her placement in Year 3 where she got to know the next year's children through the spring and summer term. The summer term has been full of fun events and trips. I really enjoyed the residential with Year 6. Herd Farm was a fantastic venue with a new range of activities such as the giant swing and zip wire (I can personally vouch for this being an exciting ride!). It was great to spend time with the children and see them enjoy the challenges and outdoor opportunities. Year 6 also had a brilliant leavers concert followed by a fabulous prom evening. The girls and boys both looked great and socialised in a mature, fun way - a true pleasure to see and be a part of. Thanks also to the key staff who have worked hard to get them ready for High School - I know they will do really well. The Seaside Day was a real joy. Everyone had the chance to either rise a donkey, surf the waves on the surf machine (harder than it looks I can tell you! ), jump on the bouncy castles or take part in mini golf. The picnic lunch and ice cream van made the day. Thanks to Mrs Mahmood and Mrs Thornton for their hard work leading the launch of this event for the first time - i am sure it won't be the last! I hope everyone enjoys the summer break and we get plenty of sunny days. Stay safe and we look forward to seeing everyone in September. I am thrilled to write this particular blog following a really successful Ofsted inspection where the school was graded “good” again. Over the last few years the staff have worked really hard to ensure the children at Westfield get a fantastic educational experience and reach their full potential, particularly in maths, which has been a focus area for the school. This has been particularly challenging over recent years with the new curriculum and assessment arrangements which have been much more difficult for the children. The evaluations of the teaching and learning in the report show how the strategies and approaches used are working well with the maths teaching being rated as at least good and sometimes outstanding. Well done to all the children for their hard work and thank you the staff who constantly strive to find ways to improve the teaching across school. Thanks also to the governors who attend meetings and data sessions and challenge all our expectations, helping us to manage our limited resources to their optimum for the children. The report also credited safeguarding as a strength and felt that parents were very supportive and complimentary towards the school. I did not, of course, see the confidential parental responses, but know they were really positive and supportive of school. Lots of parents stopped me the evening before the visit to wish us luck and it was super to have that support as always. I feel that the parents and staff always work closely together for the good of all the children in school - one of the best aspects of working at Westfield. We really appreciate these close relationships and feel very proud that the report evidences how we work so well together. Long may it continue! Our two areas for improvement were again the maths and also to continue with our focus on the disadvantaged children’s outcomes. What I will say is that the report held no surprises – in fact, when speaking to Miss Swallow, Mrs Pickin (and Mr Clay!) about the inspection report we all agreed that we could have forecast the strengths and areas for improvements. We will continue to work on these areas, in partnership with parents, in order to make Westfield the best school for all our pupils. I would like to thank parents for their support this term – a very busy one in the run up to Christmas! We normally produce a Swoop newsletter at the end of each term but due to office staff changes at the moment we have been unable to do so this time. I would encourage parents to look at all the fabulous work and activities that are evidenced on our website. Mrs Clarkson, with help from all the staff, has worked really hard to ensure that all the classes and groups in school have examples of work, trips and activities from the Autumn term. It is super to look at and constantly changing, reflecting the vast range of opportunities the children have in school. It is also a super resource to share with grandparents and other relatives who may not get to visit school very often. It also has the parent’s calendar and copies of letters to help parents out when life gets hectic – please make some time to have a look in the different sections. I would also like to thank parents and children, but especially those on the PTA for their hard work organising the Christmas Fair which raised over a thousand pounds for the Bungalow project. We are still working away at the project, the latest work has been electrical and will continue to post our progress on the notice board next the the 3B entrance. We had two visits from groups of Swedish Students this term via our links with Trinity University in Leeds. These are always interesting dates for the children in school, and a chance for the Harmony group to host visitors from abroad. They were mystified by the "Stir up Sunday" Christmas pudding that we had made in assembly which was bubbling away in the staff room in a slow cooker. They enjoyed the English crumpets and mince pies and exchanged stories of Christmas traditions and daily life with the children who asked lots of great questions and were amazed to find that there was already lots of snow in Sweden even in late November. The University always sends me a really positive thank-you email to acknowledge the lovely children they meet and how welcome they are made to feel which I always feels reflects every aspect of our Westfield School community. We are very lucky to be a part of such as super school. The last couple of weeks have been really fun and exciting in school. I always enjoy helping to run the parties and seeing everyone having fun. The concerts were excellent this year – the children worked really hard to speak clearly and sing beautifully. We also had lovely readings in our traditional carol concert at St John's Church and just this afternoon the children who have been learning instruments stood and played on the stage with great confidence. Well done to everyone. It is always sad to say farewell to a member of staff. Mr Knapton-Smith joined us in September on a term’s contract and has worked hard and fit into school brilliantly. We will miss him in the New Year and wish him all the best for the future. I am sure he will pop in to see us. Mr Clay called into school this morning and it was lovely to see him again – he is enjoying the challenge of his new post! Mrs Pickin joined us at October half term and has used her first term in school to help me observe lessons and scrutinise books as she is our new Maths Leader. She is also a member of the Senior Leadership Team and has the role of SENCO. Mrs Pickin has worked hard this term to ensure every child has had an IEP meeting. I have supported with these as she is still getting to know everyone but she has already spent time with the children on the SEN list so it has been a busy first term for her too! Mrs Picken will be class based from January, teaching in Year 5. If parents have any concerns regarding their child's additional needs, Mrs Pickin is happy to meet with you or parents are welcome to come in and have a chat with me as always. I would like to sign off by wishing everyone connected to Westfield Junior School a very Merry Christmas and a happy, healthy New Year from all the staff at school. It was lovely to see lots of new and existing parents at the Open Morning and Evening on the 11th October. The children volunteered to come back in the evening and really loved showing visitors around. The activities showcased what a great range of opportunities there are for the children in school including a wide range of exciting topics, Art, Music and Needlework as well as Maths, English and Science. Look out for the curriculum evening next term where we will demonstrate aspects of the Maths and English curriculum across all year groups and our final open afternoon on the 29th November. The Hallowe’en Disco was a great hit as always. The children looked fantastic (or should I say Fang – tastic!) in their amazing outfits. Thanks to the parents who created such amazing little monsters and ghouls, the PTA for trimming up and the staff and parent volunteers for their help on the evening. Our new Attendance Tree is full of autumn leaves at the 3B entrance to school. The government guidance for attendance is that children should have minimum attendance of 95% - our school target is 97%. Every child who achieves 95% attendance over the half term will be awarded a silver leaf on the tree. Every child who achieves 100% will gain a gold leaf. I think we will have a very full tree by Christmas as our children have good attendance overall! Take a look at the attendance figures which are also now displayed weekly on this board. It has been a busy couple of weeks in school. Firstly, our Year 6 parents attended an information evening regarding the residential trip which will take place next summer at Herd Farm. We have visited Buckden House very successfully for many years and are using Herd Farm for the first time this year. This is an exciting new venture exploring a venue that has undergone a lot of development over recent years. Miss Swallow has visited and returned with very positive reviews. She’s certainly getting excited already! Our PTA met on the 22nd September to plan the Bangers and Bingo Night and the Christmas Fair. Come along on the 15th October – eyes down for a good night out. The PTA are always glad of help at the fair which is on the evening of the 25th November. If anyone can volunteer to help in any way it will be appreciated. Look out for the next PTA planning meetings in the newsletter. I really enjoyed my time at the Gifted and Talented Maths Day at Ireland Wood School on Monday. The children worked with a Maths specialist to calculate costings if they designed and made their own game and whether it would be viable to produce. Good practice for entrepreneurs! Last night saw a number of families from Westfield visit Old Trafford to see Manchester United play in a European Cup match. I have never visited Old Trafford before and the atmosphere was great. The children cheered loudly, especially when the big stars such as Rooney stepped out and it was definitely worth the long drive on a Thursday evening. Thanks to Mr Knapton- Smith and the parents who also travelled to Manchester and made the outing possible. I always look forward to the new start to the school year as it brings exciting opportunities and everyone returns refreshed and energetic after the summer break. The Year 3 children have settled brilliantly. I have visited the classrooms most days to see how they are doing and they look like they have always been at the Junior School already! All the children have returned looking smart and ready to learn in their uniforms – thank you to parents for their support with this. The training day was spent analysing the results from both the internal systems and national SATs tests. This year's Year 6 took the first of the new curriculum SATs and they were assessed using a scale based on 100 being the average scaled score. Pupils had to reach 100 or above to be at “expected levels of attainment”. We have also analysed which types of questions children do well on/ need support on to help to inform our teaching this year and which children in the different groups need support through interventions. Staff are busy writing curriculum action plans for the year ahead and the leadership team and governors have completed a school self- evaluation exercise and new development plan for the year ahead. A busy start to the year! There is currently a governor vacancy and if any parents would be interested in getting involved in school development by applying, please call into school for more information. Mr Knapton-Smith has been getting to know his class in Year 5. We also welcome Miss Robinson who will be working in Year 4 on placement from Trinity University this term. We now know that Mrs Pickin will be able to join school after October half term as our new Assistant Head Teacher, Maths Leader and SENCO. Because Mr Clay secured his promotion just before the Spring Bank holiday it was impossible to recruit his replacement and for them to give a term’s notice at their own school in order to begin in September. As an interim measure, therefore, Mrs Jennings (SENCO at Westfield Infants) will be working in school every Friday from September to Christmas. This will ensure that our IEPs and other SEN schedules still take place as normal throughout the Autumn term with an excellent SENCO who knows the systems, children and families well. From October to Christmas Mrs Jennings will work with Mrs Pickin (another experienced SENCO) to ensure that Mrs Pickin gets to know the families and systems really well. Mrs Jennings will also get to see more of life at the Junior school which is an excellent opportunity for transition for both schools. We are grateful to Ms Lowry and Mrs Jennings for their support during the transition period. It was lovely to see so many parents at the "Meet the Teacher" evening and to get such positive feedback about how the children were enjoying the start of the new school year. The PTA meeting is on the 22nd September at 6.30pm - please come along and help us raise money for the bungalow project - see you there! As we approach the summer holiday, life becomes very busy in school. The summer term brings lots of opportunities for outdoor learning which enthuses everybody with exciting topics such as Buckden, Scarborough and Minibeasts, leading to fabulous follow -up work in school. Take a look at the Westfield Swoop (under the Curriculum section of the website and emailed home to all parents) to see work and photos of all the activities that have happened this term. Looking back over the year all the year groups have had fabulous learning opportunities. Well done to everyone for your hard work this year and thanks to all parents and carers for their support. Of course the end of the school year always brings changes. Mr Clay and Miss Hopkinson have gained well- earned promotional posts and we wish them well with these. Mrs Holmes is also leaving and again we wish her well on her new career ventures. All staff have worked really hard at Westfield and we thank them and wish them well for the future. We also welcome Mr Knapton-Smith as our new Year 5 teacher who will start in September. We recently appointed Mrs Pickin as our new Assistant Head Teacher, replacing Mr Clay, who will be joining us later in the school year. Good luck to Year 6 at their new High schools. Have a super summer holiday and we look forward to an exciting start to the new school year in September. On Saturday we had our annual Summer Fair. It was a great success and a beautiful, sunny day (until the showers at 3pm which helped us get tidied away in double quick time!). The bottle and chocolate tombolas were popular as always and the new Prosecco and Pimms tent went down particularly well. Thank you to all the PTA members who organised the event and all the staff that supported on the day. We always welcome new PTA members, please let us know if you would like to join our friendly team. In total, we raised just over £1200! This will greatly help with the restoration of the bungalow. On Saturday 2nd July it is Yeadon Carnival and this year's theme is Roald Dahl. We would love some Westfield Junior School children to join with us in the parade, a letter came home on Friday with all the details and is on the website. Please return the slip or give us a call if your child would like to take part - get dressed up as your favourite Roald Dahl character. The last couple of weeks since returning from the Spring Bank Holiday have been really super in school. Firstly, the Year 6 residential to Buckden House went brilliantly. Miss Swallow has spent the best part of a year organising this annual visit and the children get so much out of it. I was lucky enough to go for the start of the week and experienced a very hot Valley Head Walk, orienteering both in the grounds and around the village and even some welcome paddling in the stream! The children were great as always – one of the best things about residentials is the chance to see Year 6 in a different setting and really chat with them and have some fun. There are always some surprises when particular children unexpectedly shine through and show a real talent for finding the orienteering signs or following the map. I really enjoyed the trip and would like to thank all the staff who worked hard to organise it, the parents who sent the children well equipped and the pupils whose company I shared. The photos on the website speak for themselves. Whilst we were at Buckden the gym club were practicing hard for the “Let’s Celebrate” event at Guiseley Theatre. Miss Skillington told me that they performed really well and looked super in the new kit. Well done everyone. The Health Week this week was a success with a fun run that everyone took part in. Some children really challenged themselves and achieved some amazing results. Friday saw the Queen’s Birthday celebrated in school with a day of activities, bunting, a “decorate your bike/scooter/pram competition” and a street party on the playground for the whole school. The children looked great in patriotic dress and red, white and blue, especially the Queen (Mia) in Year 3 who tempted me to curtsy every time I saw her throughout the day! It was very busy setting up a party tea for over two hundred children and we were glad of the help from the mum’s who came along on the day. The rain did arrive just as we ate our tea but it did not dampen the spirits and Mr Clay selected every song about rain he could find just to remind us! At one point I stood back and looked at the whole school sharing tea and felt uplifted by the party atmosphere – everyone having a lovely time chatting and eating – a great sight. This week the leadership team will begin to evaluate the achievements of this year and plan the new targets for next year. Please help us to continue to improve school by returning our questionnaires with your ideas and thoughts. It's been a really busy couple of weeks in school. The SATs test week is the most carefully managed week of the year as we want every child to perform to the best of their ability but to keep it as stress free as possible. Miss Swallow and the Year 6 team always spend a huge amount of time behind the scenes making assessments of the children’s needs over the year to ensure that all pupils are supported and confident during the tests. Despite the government comment that children should be unaware they are taking SATs and should not celebrate the end of the SATs week, I feel that anyone at all who works in schools across the country or has a child of KS2 SAT age will appreciate that in our world of assessing children and schools, many children find it difficult to escape the nerves of SAT week! What I can say is that the children could not be better supported – breakfast clubs, mentoring, booster classes to rehearse and increase confidence, careful timetabling so that pupils who need extra time or support can have this without disturbances, seating arrangements to support all the children and even adaptations to the playtimes and lunches to allow the pupils minimum disturbances and therefore the best chance of doing well, all take place. All staff are involved in the process and we have governors who come in to check the tests are carried out correctly. The end of KS2 SATs are a reflection of four years of hard work by children, teachers and parents and I know all our pupils have done their very best. And finally…yes we did have a SAT party which the children and staff thoroughly enjoyed and was a fitting end to all the hard work! I believe everyone should reward themselves and others for working hard and enjoy sharing a bit of fun with others both at school and in future life. Well done to all the Year 6 children and thanks to all for their hard work. Thank you also to everyone who took part in the Trinity University Rotary Club Sponsored walk for the bungalow project. We have put up a new display board in the playground and will start to show the totals raised on there. The asbestos was removed at Easter and the builders will be back in through the Spring Bank holiday to remove the internal walls and put new fire doors in. A peep through the windows shows the start is going well. Our aim is to have a great room for interventions, lessons, outdoor learning, meetings, nurture, after school/holiday clubs and community use by summer 2017. Watch out for fundraising events and I will keep parents up to date on progress. This week has been an amazing, busy, celebration week for the 50th Anniversary of Westfield School in the current building. The school began its life as Henshaw and Whackhouse Primary school in Nissan huts on the current site in 1944. I spoke to the children in assembly about this as we found the original log book which I showed them in assembly. The log book recorded many of the daily events of school life similar to our school today – staff illness, painting and maintenance work, open afternoons for the parents to see the children working etc. It also logged the installation of the new asbestos – ironic when we are currently managing and removing asbestos in school today! Perhaps the most moving entry is when the head teacher records the announcement of the end of WW2 and Churchill signing the paperwork. It then records the next day’s celebrations and day off school for Victory in Europe Day. More recent log books ceased in the late 1980's when it was no longer a requirement to keep one but they form an amazing insight into the daily running of the school over almost five decades. The school expanded with the estate to accommodate the local mill and AVRO workers and the new building that we are in now was opened in 1965. Again, we expanded through the next few years which resulted in the Infant building being erected in the 1970’s as we expanded to a two form entry Junior school. Many current and past parents, past pupils and members of the community attended the open day on Thursday, including local councillors, Rotary Club and the previous owner of Ives Mill. They were transported back in time telling the tour guides about their happy memories and favourite teachers and sharing their amazement at the new library, computer suite and grounds. Some visitors found their names in the log books and registers and recognised themselves on the old photographs. It is always lovely to see past pupils and hear of their successes in life. What a fabulous day! The week has been full of 50th celebrations. Pupils across school have produced art works in readiness for the Trust Art exhibition next month based on “Our Community”. We had a super visit from the Aireborough Local History expert with artefacts and a workshop. The week ended with a “Decades Day” where the children and staff came in outfits from the different decades and time travelled through each year group to experience music, art, history, dance and technology to name a few of the activities. Pupils seemed to especially like the Pong computer game (which I thought was amazing when it appeared in the 1970’s but now looks like the slowest moving thing ever! ), the Hokey Cokey, the Conga and dancing to Saturday Night Fever routines. It brought back a few memories and we had lots of fun. Finally, can I wish Mrs Jaciuch a happy retirement as she leaves on Friday. She began work at Westfield as my job share partner some sixteen years ago and has worked in every year group. She has always been an incredibly hard working, well loved, caring teacher who has gone the extra mile with projects in the garden and School Council – a real advocate for pupil voice. We currently have a veggie box growing for the Yorkshire Show as a result of their hard work with Mrs Hopps. I hope Mrs Jaciuch has a super retirement and a well -earned rest. It seems like a while since my last Blog posting but with the Easter weekend and then the additional two week holiday we have not seen so much of April in school. The days that we have been here have seen extremes of weather from lovely summer sunshine to snow this morning, which took us all very much by surprise! The remaining chicks developed well and returned to their owner at the end of the term. It is amazing how quickly they grow and begin to develop hen- like features rather than the fluffy newly hatched chicks that we had started with just a week or two before. We must be attracting birds at the moment as we had a pair of ducks in the pond on the return from the Easter holidays. The female kindly laid an egg, though she was obviously not feeling sufficiently broody as did not stay to sit on it! Year 4 have been using the pond area for their current topic and also visited Dog Mill Pond this week with Steve Warrilow, the wildlife warden from Denso Marston in Baildon, helping them to identify aspects of pondlife. We had a lovely letter from a parent helper saying what a super day it had been. We are very lucky to have such a good range of facilities and places to visit on our doorstep and try to use them as much as possible. Thank you to all parent helpers that make the trips possible. We also had return visits from the RSPB to carry out a further “Bioblitz” in the playground. All Year 3, 4 and 5 children have now spent time in the grounds searching high and low for signs of wildlife in their habitat, again a great opportunity for pupils to get outdoors and discover the world around them. Year 5 have had a noisy launch to their “Brazil” topic, using drums and rhythm instruments to make music in the Samba workshop. It sounded great and certainly worked off some of the Easter chocolate! Miss Johnson has been successful in gaining a place for Westfield in the Rio Samba event where some of our children will learn a samba sequence and then take part in the biggest Samba band in Leeds, performing with lots of other Leeds schools – very exciting! Over the holidays you may have noticed workers in the bungalow. We removed the asbestos as the first aspect of the refurbishment. We would really love to have a room that we could use for classes, meetings, nurture groups and evening and holiday lettings. Our plan is to develop the bungalow overcoming months to make it an adaptable and use-able space. Watch out for my letter telling you more details next week and launching the bungalow fundraising appeal. Our first event will be in coordination with the Aireborough Rotary Club, a sponsored walk in Horsforth on the 14th May. Please dig out those walking boots and come along to support us! Westfield has been full of hands on learning opportunities over the past couple of weeks which is fantastic and makes school life so much more exciting for both staff and children alike. 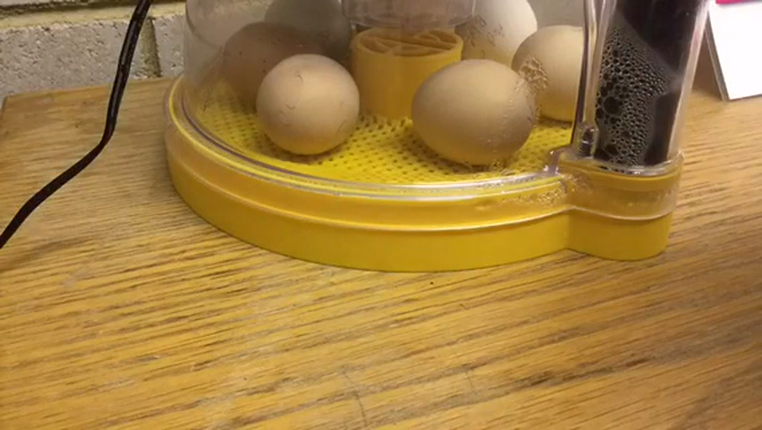 The children awaited the development of the eggs in the incubators with great excitement and were rewarded by the first signs of hatching on Wednesday. As you can see below, the process of the chicks hatching is an amazing one (Mr Clay filmed it and then speeded it up for us) but also a risky one! We were expecting at least half a dozen hatchlings and the second of the brood arrived on Thursday morning – popping out in a matter of minutes. Then there was very little action… After a phone call to the “Chicken Lady” on Friday morning, we were advised that we must not have had a very fertile clutch of eggs and there may not be any more chicks this year. Although this caused some disappointment after all our hard work, the two newly hatched fluffy chicks were now in their brooder and getting on fine. Surprisingly, our third, and unexpected chick arrived on Friday afternoon but did not look well. He seemed bigger than the others, but very wobbly and did not get moving as quickly as they had. The previous chicks had begun to dry out very quickly and, although he remained in the incubator (they need to do this for a number of hours to keep warm, dry out and absorb the yolk) he was obviously unwell. We were instructed to assign someone to take them home for the weekend so they travelled along at a very slow pace to Baildon in my car and were given pride of place in the lounge, much to the disgust of my daughter’s indoor guinea pig, Toffee, who has definitely felt upstaged all weekend. After a sleepless night on Friday, I sought advice again about the poorly chick. I was told that it may not survive and that its best chance may be to nurture it warmly against myself and feed it honey and water solution. After a dropper was found, and a visit to the Co-op made for the honey, we then spent around six hours cuddling him, (snuggled in a duster on a warm wheat bag) and drip feeding him, but unfortunately were unable to save him. This was so sad but does sometimes happen and is one of the aspects of hatching chicks that we unfortunately have to accept as Mother Nature’s way. The good news is that the two surviving chicks are thriving and keeping me busy on Mother’s Day! I will return them to school in the morning so that the children can care for them and watch them grow throughout the week ahead. This has been a fascinating experience for all the children in school during the approach to Easter and, despite the disappointing loss of one chick and a slightly smaller brood than usual, we will definitely repeat it next year. Miss Swallow has worked really hard to complete the Library, continuing the good work started last year by Mrs Scargill, who initiated the redesign and redevelopment of this essential part of school. It is now looking superb and was opened on Friday by visiting author Emma Barnes and Councillor Pat Latty. Emma then spent a day in school, working with classes and signing books – a fitting end to an excellent Literacy and Library fortnight. I teach reading to year 6 in the Grassington room every week and can see the impact that the improved learning environment has, both on the use of the room for Library purposes but also for sets, boosters, nurture, music lessons, meetings and lunchtime clubs run by the lunch staff. Thanks to all staff for their hard work, including Mrs Thornton, our Business Manager, who had the job of managing the project – from the new roof last summer holiday to the lighting, ceiling, fittings, furniture, carpets, blinds and books. We sometimes forget that all staff in school are working hard towards the same goal, often behind the scenes - making the place as super as possible for the children to achieve the best they can. We were visited by staff and pupils from Benton in assembly on Tuesday to launch a planned art exhibition in June. The local Aireborough Learning Partnership Trust are to run a display to celebrate our local community, working together as a Trust. This will coincide with our celebrations of 50 years since the opening of Westfield School. I will let you know more nearer the time. I had a great day in classes on Thursday when the RSPB sent a worker to help us carry out a “Bioblitz”, looking for wildlife in the school grounds with Year 4 and 5 children. This is a project sponsored by Aldi to enable the RSPB to carry out wildlife education in schools. The children were encouraged to look high and low and left no stone unturned! Many children do not spend as much time outside as they perhaps used to and don’t always know the names and habitats of common wildlife. There was great excitement at the discoveries and they enjoyed referencing their identification charts, amazed at what could be found around the pond or in the compost bin! Catherine is returning next month to carry out the same tasks with Year 3 and the remaining Year 5 children. And so we reach the end of another busy half term! Well done to all the children who worked so hard training for the Leeds Athletic Plate. We eventually came fourth in the competition and though the competitors were a little disappointed, I feel that is still a huge achievement considering that over 130 schools began competing. After the first rounds the children who are still in the competition are either placed in the league for the Leeds Trophy or the Leeds Plate. To get to the finals of the Leeds Plate is in itself a huge achievement and the competition is fierce. I think the teachers and children should be very pleased with their achievements - they have all worked really hard with early morning training sessions and they did Westfield proud! The Year 4 trip to York was a great success. The children became Romans for the day and really experienced the Roman way of life. These trips bring the curriculum alive, develop deeper learning and understanding, and are often the things that pupils remember in years to come. We have recently taken delivery of two batches of hen's eggs in Year 3 and 4 which are due to hatch in about three weeks time. I have already had past pupils who have told me they remember having chicks at Westfield Junior School when they were there. I can assure you that when the lady arrived with her hens and eggs to talk to the children, there was great excitement - even from the staff!. The hens are special breeds and the children were given lots of information and facts about them. We now wait anxiously for the appearance of the first chicks. Mr Basson has been tasked with checking the eggs and topping up the water in the incubator over the holidays. Apparently, when they start to peck their ways out of the shells, we have to "cheep" to encourage them on their journey into the world. Watch this space! I spent a busy evening with the School Governors earlier this term. Two Governors recently resigned their posts after a number of years, due to work commitments. We have welcomed a new parent governor, Mr Darren Mawson, to the Governing Body and we met to re evaluate our range of skills and work these into the Governors' Action Plan. The Governors work really hard to support school and these types of evenings actually highlight the wide range of skills and expertise we are fortunate to have on our Governing Body. I also met with Mr Graham Sproats, a parent who also works for CAP (Christians Against Poverty). This is an organisation which has grown and grown and is now one of the main debt and budgeting charities in the UK. Last year Graham came into school to carry out a Year 6 workshop where the children were given a lesson on budgeting and managing money and then a challenge where they were given an imaginary budget and had to make decisions on how to spend it. Other challenges and temptations were thrown in too which made the challenge even greater. This is excellent for team work and debating but the main focus is to educate our children in order for them to manage their money well as they grow up. The adult sessions will look at financial issues and how to make better use of your money, or indeed become debt free. This is an excellent course and I have often had parents request help with budgeting skills in meetings so hope to see people take this opportunity to learn from Graham and his team. It is suitable for anyone at all that would like to learn how to get more from their money - please sign up at the school office if interested. I hope everyone enjoys the half term break and the weather is kind to us. Don't forget the Bangers and Bingo Night on Saturday 27th February! Well done to the athletics team who came second in the Leeds semi finals this week despite tough opposition. They now go onto the finals - good luck! I spent a super day yesterday with representatives from the School Council and Harmony Group at the North West Leeds Children's Services Pupil Voice event at Horsforth High School. The School Council give a voice to all our pupils in school and regularly meet with me to discuss ways to improve school and feed their class ideas back to the Senior Leadership Team. The Harmony Group was set up when the school worked towards the Stephen Lawrence Award a number of years ago. This award was devised by Leeds City Council in liaison with Stephen's mother following his death in a racist attack. The process of the award made us examine all areas of cohesion, community, inclusion and harmony in our school, shaping those areas in the school community we have today - and so the Harmony Group was born. These children still promote the same themes through surveys, assemblies and joint meetings with the School Council but also help to host visitors to school, especially foreign links visitors such as the Swedish students and French teachers. They also coordinate the Fairtrade events each year. We began the day hearing about the aspects of their community that the children like such as parks, trees, wildlife and good places to eat and shop. The children had to also voice the things they were concerned about, these being such things as traffic volume, potential new housing, lack of youth facilities and what happens to the elderly in the area when they see local elderly care facilities being replaced by housing. These were all ideas from the children but it struck me that they are just the same issues as many local adults also worry about. The local councillors attended and talked to the children about their job roles, interests and the concerns that local people have such as traffic and flooding. Local children also spoke representing the Youth Parliament and groups such as the Yeadon Youth Group. After a lovely lunch and chance to meet with other local school representatives such as St Oswald's children, there was a planning session where groups of children mixed and suggested ways to spend the £56,000 that the North West has for youth and children's projects. I spoke to Councillor Pat Latty who often visits school and secured some of the funding towards our cycle shelter last year, about the School Council and Harmony Group visiting the Civic Hall and she is going to look into this - watch this space! Overall it was a great day - we will report back to the whole school in assembly next week. I would not be surprised if a few local children who attended this event will be encouraged into being our next generation of councillors in Leeds! Welcome to the first Blog of 2016 and Happy New Year to all the parents, children and staff of Westfield Juniors! With the floods of the Christmas break and the current cold snap, the return to normal routine can be hard at this time of the year. At least the lighter nights are starting to slowly creep in and the children have started working on new topics with enthusiasm - a walk around school evidences this on a daily basis. The Wildlife group has started for Year 3 this week with children threading nuts to feed the birds who are also suffering with the weather. School has a new art club provider and there are lots of other clubs running to occupy children who cannot get out to play after school on dark nights but would still like to socialise and challenge themselves to learn something new. See the website or call in to reception for details (Mrs Clarkson puts together the clubs timetable as part of her role as curriculum leader). One big focus for staff at Westfield, across the cluster and indeed the country, is the application of new assessment systems. With the disappearance of levels and the introduction of a mastery based approach to the curriculum, we are working with our own staff and the cluster networks to assess the children using the new Aireborough Learning Partnership Trust (ALP) Assessment Handbook. To find out more about how we are doing this (and how it is going so far! ), come along to our information evening on Tuesday 19th January 2016 from 6-7pm, we would love to see you there. Enjoy the weekend and watch out for the snow forecast! The Carol Concert on Monday was lovely, a chance for the whole school to come together and celebrate Christmas in a traditional way. Well done to all the readers and for the lovely singing in school and thanks to all helpers who walked to school with the children. Christmas dinner saw a great uptake from children who normally have a school meal and those who usually eat packed lunch. Staff helped to serve a turkey lunch to over two thirds of the school's children - all the vegetables were hand peeled - thanks to kitchen staff for preparing potatoes and sprouts for 170+ children plus staff! The end of the term was full of fun in school. I always enjoy spending time with the children at the parties. The old tradition at Westfield has always been for the Head teacher to run games in the hall for part of the afternoon (with help from Mrs Wear, Mrs Mahmood, Mrs Dandy and Mrs Nutter!) whilst staff set out the party tea and this is a tradition I would never choose to change. Despite the tiredness at this stage in the term, the great thing about running party games is that I get the chance to play with and have fun with every child in school. This is so important - everyone should have the chance to celebrate and enjoy themelves after a term of hard work and life skills are learnt even in parties, such as taking turns, joining in, listening to instructions and smiling when you lose! These skills were also evident on the last day when children played games as a reward for a term of hard work and good behaviour, many children enjoying traditional board games with their friends. One third of childen felt their parents were on mobile phones too much and almost half of adults surveyed felt they did not have enough time to play with their children. None of the suggestions mentioned playing alone on a computerised game.This did make me think! As a parent as well as a Head teacher I know how my time at home during term time can be very limited and Christmas is a chance to spend time with my family. Looking at the above list, many of the activities children have said they would most like to do are ones that I do with my daughters over the festive season and these are some of the things I really enjoy about this time of year. Sometimes the most simple things are the best bits of Christmas. Let's hope everyone at Westfield has a very Happy Christmas and chance to spend time with friends and family. Here's to a Happy and Healthy New Year for everyone. What a busy fortnight in school! Christmas and all the excitement and magic are now very much upon us! Last week saw us hold the final autumn open morning for prospective parents. I always feel very proud to show people around the school. The school councillors greet visitors in a mature, professional manner, always keen to tell people about the work they are doing and school always looks super. Well done to all the children who represent Westfield so well at these events. On Thursday we were treated to the pantomime performance that I had mentioned, funded by the PTA, only when the actors arrived it became apparent that the version of "A Christmas Carol" was not a pantomime type one but a more serious show, telling the traditional tale of Scrooge. The children were transfixed by what was the best acting company we have ever had in my time at Westfield. It amazes me how these small travelling groups can produce a whole play with such a small number of actors and scenery. Thanks again to the PTA for this seasonal treat. Progress meetings have been taking place over the last two weeks, as they do termly throughout the year. Each class teacher meets with myself, Miss Swallow (Senior Leadership, English and Assessment Leader), Mr Clay (Senior Leadership and Maths) and Mrs Mackay (a former Westfield teacher and SENCO who is now the assessment governor). We discuss different classes, sets, intervention groups and individuals to see who is progressing well and who needs more support in order to make better progress. This informs how we plan intervention groups for the following term and focuses on pupils who need a boost, but also gives lots of opportunities to celebrate the great efforts and progress that many children have made. I really enjoy these meetings as you can see the progress individuals are making as they travel through the school. It is also time to thank the staff for their hard work as we reflect on the detailed planning of activities to support the children in their care. We will be planning the Spring interventions before Christmas, ready to start in January. I travelled up to the Infant concert on Tuesday morning which was a real treat - fantastic singers and actors are coming our way if this was anything to go by! Our Junior concerts were really super this year. Every child who takes part in the production has volunteered to do so and the commitment to learning vast numbers of lines in a short space of time and the beautiful singing were a joy. I had one email from a grandparent saying how super it all was - the costumes, singing and acting. When I get an email like that it makes my day to know someone else has enjoyed the concert so much. Over 140 children walked and cycled into school for mincepies on Thursday, despite the dreadful weather. This was a tremendous effort - the children have really embraced the cycling, scooting and walking and it has been great to still work with Mrs Murray in her new role with Sustrans this term. There's still lots of fun to come - parties, carol concerts, Christmas dinner, film afternoon...now I just need to crack on with some Christmas shopping! What a super evening at the school fair last night. I always feel that the Christmas season starts with the fair when the tree goes up and the children bring out the Christmas jumpers! Thank you to all the parents and children who brought contributions for the fair - it really does make a difference to the school. This year's PTA money will fund the library project in Grassington Room. We have ordered the new library furniture and I am sure the children will be excited to get in there and read. It will also make it a more attractive room for additional sets to work in and nurture groups, music lessons etcto take place. We are always short of space in school so any extra room needs to be maximised and this will make it a lovely learning base. Hopefully, the room should be complete by the start of the New Year term. Earlier in the school year I wrote to parents to appeal for new members and helpers on the PTA. I am pleased to say we managed to gain a few new recruits who have already helped with the fair and the first meetings of the year. It is so important that new members are encouraged to join as this keeps ideas fresh and ensures to continuity of the PTA when older children ( and their parents) move onto high school. Any help is welcome and the PTA do such a fantastic job - over the years they have purchased the Pavilion, ipads, a Clavinova for the hall, decking, the school pond and the library to name but a few. They also ensure that every child experiences a Pantomime each year (Oh yes they do!) by funding the show in school and donating smaller amounts for items such as lunchtime equipment, sports kit and subsidies for the Year 6 Lightwater Valley trip. Thanks once again. We began the week with the ethos statement based on respecting the beliefs of others. The children were shown the new advertisement by the Church of England which has been designed as a cinema trailer in the run up to Christmas to encourage people to think about the power of prayer, but will not now be played because it has religious content. This has opened up many lines of debate in the media. The assembly focused on why the Lords Prayer was initially written and began the debate on whether the advert should run, but also became a week long debate regarding whether we should use the prayer in school. Very few children had heard the prayer before or knew the prayer and many had been to weddings or other gatherings and felt they would have liked to have been able to join in. All sorts of viewpoints were aired - some pupils felt the prayer may upset some of the children in school and others felt we should say it occasionally as it is part of the heritage of our predominantly Christian country. What mature, deep thinking pupils we have at Westfield. Some of the points discussed were ones that the staff had not even imagined would arise! Many pupils suggested using the prayer occasionally in assembly so those who wish to say/learn it may do and that those who want to join in do so whilst others may chose not to. The debate will continue and a final decision be made over coming weeks. Finally, well done to Mrs Holmes and her athletics group who did really well in the athletics this week and now go onto the next round of the competition. Also well done to the pupils in last weeks "Bullying Week Stomp" - we made it into the "First News" children's newspaper! It is the end of Anti Bullying week and I have been really impressed by the way in which the children have discussed the issues faced by bullies and the bullied with such thought and reason. Thankfully, bullying is very rare at Westfield but when it does happen we often find that the bully may have been actually bullied themselves in the past or have experienced things that make them feel angry towards others. These topics were discussed in open, thoughtful ways across school during the week. The theme for the week was "Make a Noise About Bullying" in order to stamp it out and our end of week assembly reflected the work carried out throughout school, with raps, drumming and lots of story boards and art work. One particularly thoughtful aspect to the assembly was the art work from Year 6. The children had made Eiffel Towers in the colours of the French flag, as a symbol of support for the victims of the terrorist attack in Paris. The pupils in Year 6 had discussed the attack and saw it as a form of bullying and wanted to make symbols of support for the victims and people of France. These types of events are always so difficult to discuss with the children. We need to give them information and facts so that they can try to understand what is happening and be informed as the future citizens of the world but also not be too frightened by the events. Questions were discussed in class when they arose through the week though when such awful events happen the teachers do not have all the answers - who does? The children always amaze us with their thoughtful responses and support for classmates and the wider community, including their support for people of all cultures who live in harmony both in our local communities and across the world. We must teach them to work together in the hope for future peace. The children were reminded of the Anti Bullying Policy that we have in school and the procedures to follow if they, or a friend, is being bullied to ensure that the staff can deal with any issues quickly and effectively. It is so important that we hold Anti Bullying week annually to make sure our children know how to recognise bullying (and the difference between this and a fall out with friends) in order to keep themselves safe. Our final Anti Bullying activity was to make a noise and they certainly did! We gathered in the hall today to carry out a whole school "stomp" with the stamping of over 250 pairs of feet deafening us all! Miss Swallow recorded this (see it for yourself on the website!) and photographs were also sent in to "First News" (children's newspaper) where we may appear in print next week. I will let you know if we do, until then, take care. What a luminous day today in school - just the thing to brighten up the dull, dark mornings that we now have in the second half of the Autumn term. Mrs Murray came in last week as part of her new "Bikeability" role to start the term with a Walking/Scooting/Cycling theme to it as we are working towards a new award for getting everyone moving and the children certainly rose to the challenge of "dressing to be seen" in the Autumn and Winter months. As the day coincided with Children in Need there were also lots of Hi Viz bears around! Thanks to all the parents who sent donations for this important fundraiser. Whenever I watch the Friday night Children in Need programme I am thankful for all the good things in my own children's lives and those of most of the children in school- this really is a fantastic national fundraising event to help children in need of support across the country. We will let you know through the news letter just how much was raised. Mrs Holmes and Mr Hiley have sent out letters regarding scooting in school which is an exciting way to get children exercising, especially at this time of year when we are less likely to head outside! I will be having a go myself - give me a wide berth! I may need some of the scooter skills sessions planned! The assembly to mark the minutes silence this week was very poignant. Year 6 sang beautifully, with solos, duets and group contributions to World War 2 songs in remembrance of our brave troops both past and present. Each year I feel the respect and understanding of the children grows and grows and rightly so. When I was a child in the 1970's I do not remember schools raising such awareness of the remembrance celebrations and it is so important that children know the history and impact of these events if there is to be the best chance of peace in their lifetimes. I felt very proud of all the children and the way that they took part in the proceedings with real respect and consideration this week. The WW2 themed lunch and author visit added to the day. Well done everyone. Our other themed lunch this week celebrated Diwali - another Autumn celebration which lights up the dark days and follows the theme of good conquering evil. This was enjoyed by the children and thanks go to the lunch and kitchen staff for the themed lunches that the children really enjoy. Our Walkshire theme continues next week - get moving and blow thoses cobwebs away! Welcome back to the new term and also to my first Head teacher's blog! This is an exciting addition to the school website where I will have the opportunity to tell everyone in the Westfield community about latest news and events at school. This week has seen a busy start to the term with History Week happening throughout school based on "Remembrance". Poppies have been used in all areas of the curriculum such as art, PSHE and history to name just a few. The Harmony Group have been busy selling poopies around school and we will let parents know the total raised in the newsletter.On Friday morning I covered Miss Swallow's class where every child performed their poems based on the themes of war. The children had developed ideas based on themes such as Hope and Fear with amazing results. Their empathy for the soldiers and their emotions and the quality of language was superb. The children tried very hard to learn quite long poems by heart and, with the exception of a few prompts, managed to perform whilst another class member filmed them doing so. The atmosphere in the class was electric with every child listening to their peers with genuine interest and respect. The Remembrance activities in classes across school are so important because we need children to know about the history, reasoning and impact of war but it also links to the British Values aspect of the curriculum. The values were so in evidence in 6G, not ony in the poems but also in the respect, support and encouragement that every child received from their class mates during the performance. Pupils from all classes shared their work in Thursday's assembly and the breadth and quality of work was excellent.Well done to all the children across school for a brilliant week of history work and to Miss Johnson for organising this. Next week the theme will finish with a minutes silence in assembly at 11 am on Wednesday morning followed by a WW2 themed lunch and a visit from a children's author who has written and will be selling her books about WW1. The Harmony Group also did a splendid job of hosting the Swedish students that visited school this year. One aspect of our International links is to work with Trinity University when they host trainee teachers from Sweden each year. These teachers visit Westfield for the day to find out about school life in England with research questions at the ready! Themes this year included gender in English childrens books and whether girls or boys choose particular types of books, the English school lunchtime systems, PE and Sports activities and funding in England and the organisation of the school day. Our Harmony Group reps answered all their questions in detail and asked lots of questions of their own. The trainees visitied each class and spoke about life in Sweden and answered questions from the children. This is a great learning experience for the children and trainees and the feedback we get from the University always says that visitors find the children a delight and the school to be really welcoming and informative. There may be another group to visit later. Well done to all the school reps, you do a great job. Hope everyone has a super and safe weekend - I'm sure the fireworks get bigger every year!